In the late 1940’s and early 1950’s, the Christ Ambassadors of Section-8 were young people who had a burning zeal for God. They did not go idle. If no ministry was offered them, they went in search of some way to minister for the Lord. 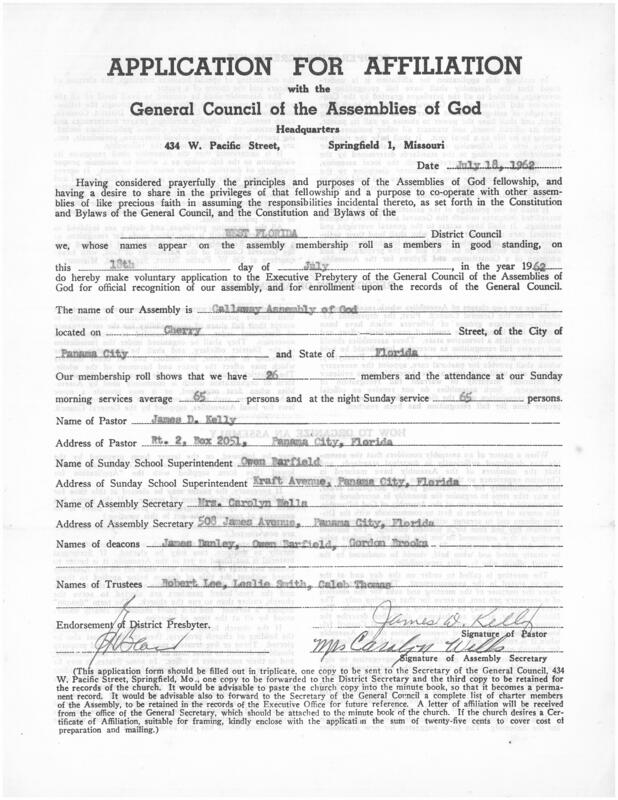 In those days, most Assemblies of God churches had large numbers of C.A.’s, and at that time all churches worked together as one for God. If one church had a vision for a particular evangelistic thrust for God, all of the others would work together as one. Unfortunately that kind of zeal and Christian cooperation between churches has long been lost! What a pity! The C.A.’s, primarily of First Assembly of God, saw the great need of evangelism in the Callaway area. They went to Callaway and erected a bush arbor. But, the thrust was short lived because of an enormous resistance by the people of Callaway, the the Pentecostal message. The majority of the C.A.’s involved in that evangelistic effort, as well as the older people in the various churches, came to the conclusion that Callaway was impenetrable and the people were untouchable. All evangelistic efforts were abandoned primarily for fear that some of the young people (C.A.’s) might receive bodily harm from the opposers. Callaway lay dormant, and unevanglized for a number of years. From the book of Malachi to the book of Matthew is a period of about four hundred years. It is often called “The Tunnel Period,” because there were no recorded visions or messages from God. It was a long, dark, period in Israel. It almost seems that God had forgotten Israel, and had given them up. But, history has proven that God had not given up on Israel; He had a target date in mind when He would once again visit them. At the conclusion of that tunnel period, God gave Joseph a “night vision” (dream) revealing that it was God’s time to revisit Israel, and the world, through His Son Jesus Christ. (Matth. 1:18-25). Callaway, just as Israel, had a Tunnel Period to go through. They had rejected God’s message the first time (with the C.A.’s) but, God had a target date when He would once again return to Callaway with the message of Salvation. That new vision came to Rev. S.W. Knoles, in 1958. At that time he was the Associate Pastor of First Assembly of God. Because of the position that he held, he knew that he must exercise great Godly wisdom in whom he would confide in about this new vision in order to avoid “troubling the waters” before the vision could be brought to fruition. From time to time over the years Brother Knoles and I worked some together in the ministry. We had a great respect for one another as men of God, and as ministers of God. We had a binding love for each other much like David and Jonathan. There was an unquestionable trust between us. Because of that Brother Knoles came to me and made bare his heart about the vision he had for a church in Callaway. The sparks from his heart fell upon my own heart and we formed an alliance that we would, by the Grace of God, go to Callaway as one man and establish a new church for the glory of God. Since a church can only have ONE leader at a time, we agreed that he would be the official Pastor, and I the Associate Pastor. We further agreed that he would be the principal pastor and that I would do most of the preaching. Therefore, we had a perfect understanding of each of our roles in establishing a new church, and there were never any misunderstanding between us as we worked together. Brother Knoles and I knew that we must have the blessings of First Assembly of God, in order for the efforts to be a success. 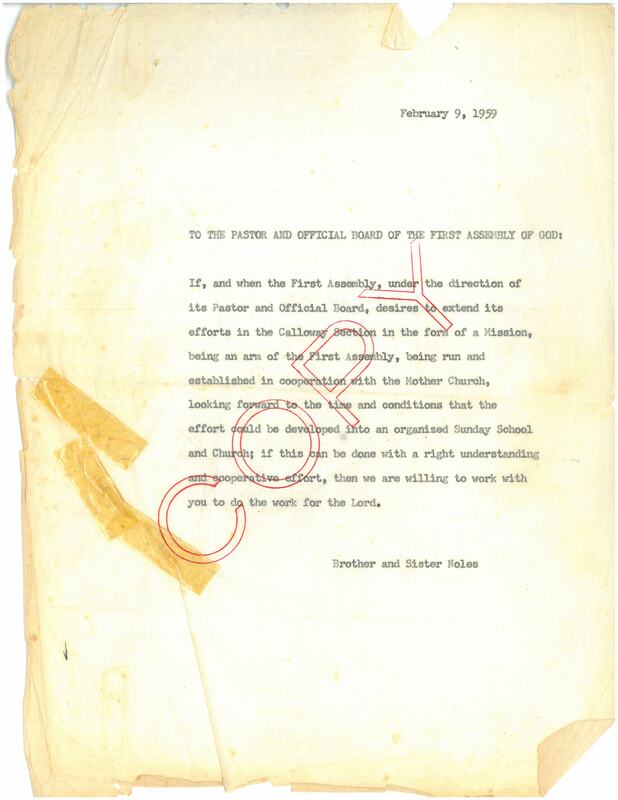 Brother Knoles drafted a “letter of intention,” to present to the Pastor of First Assembly, and the Board of Deacons. Since he was an Associate Pastor of First Assembly, at that time, we thought it better if I would appear before that pastor and its board to seek their approval for the new work. I read the letter to them and fully described that we were going to Callaway, not just for a seasonal revival, but with the full intent of establishing a new church there. Brother R.C. (Keetah) Jones was the pastor. As soon as I finished describing our intent, Brother Keetah quickly approved of it and told the deacons that he thought that every one of them should sign the letter. They did, so the main hurdle was achieved. It should be recorded in this article of the history of Callaway Assembly, that although we sought the approval of the First Assembly, we did not ask for money or any other kind of assistance. Neither did they ever volunteer any kind of assistance. 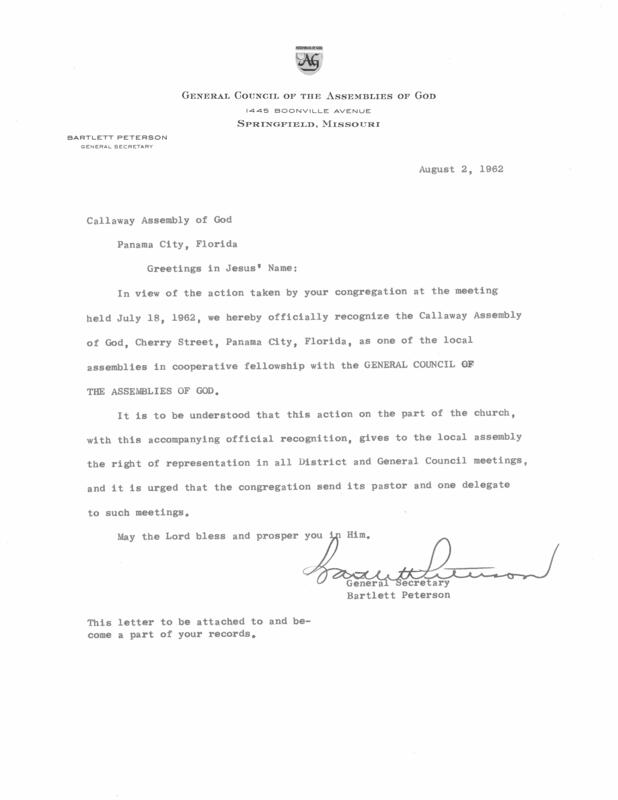 Nor did the West Florida District of The Assemblies of God, ever offer any kind of assistance. Callaway Assembly can be proud of itself that it never had to beg from any other church, or the District Office; as it were, she stood on her own two feet, and God never failed her in her infancy! To God be the glory! The miracles that God gave us are too numerous to mention in this brief article. With the letter of intent approved by the Pastor and Deacon Board of First Assembly, in hand, we then made public that we were going to Callaway, to establish a new church. We had almost no money to start the work with but, we knew we were in God’s will and that somehow He would supply all our needs according to His riches in Glory, by Christ Jesus our Lord. He did. There were no buildings available in the area of Callaway where we felt God wanted us to establish the church. We then learned of an Assemblies of God, minister in Fort Walton Beach, who had a tent for sale. The size of the tent was just what we needed. Brother Knoles and I went to Brother Ira Brown’s home (Iris Brown’s father) and asked the use of his pick-up truck. I drove us to Fort Walton, and we were able to locate Brother Wilson, the minister who had the tent for sale. He had it stored in a vacant house. We inspected it and decided together that the tent was in good repair. Both Brother Knoles and I had a great deal of experience in tent evangelism and were, therefore, able to readily assess the quality of the tent. The work in Callaway, was too young to have any money in its treasury, so Brother Knoles paid Brother Wilson $300.00 of his personal money for the tent (it would later be refunded by the District, thanks to the efforts of Brother Crawford Railey). Returning to Panama City, with the tent, we were successful in getting permission to erect the tent on the north side of Cherry Street, in the near vicinity of the present day SunTrust Bank. The field was overgrown with high weeds and had to be cleared before the tent could be put up. Rev. J.W. Hunt had two of his ministers, Rev. Red Emanuel and Rev. Mallary (cannot remember their given name) come and assist us in any way we might need them. They brought their own lawn mowers and cleared the property for us. They also assisted us in erecting the tent, we had absolutely no furnishings to put under it. Again Brother Hunt came through for us and gave us enough used pews to fill the tent. Brother Emanuel and Brother Mallary helped haul the pews and set them up for us. Brother Hunt and his people were the only pastor and congregation that helped us in any way. The Lord remember them for their love, compassion, and Christlike cooperation in helping us to found the Callaway Assembly! After approximately one month of operation, the new church had its first revival. A Brother Duck, I believe he was from Alabama District, preached that first revival. He was retired from the ministry but the call was still much alive within him. Although there were no sinners converted during that time, it did seem to solidify the small group that we had, and it firmly establish the fact that Callaway Assembly, was in fact, and that it was there to stay. The work slowly grew. Brother Knoles was not in good health and the stresses of the work began taking its toll on him. Within himself he knew he must do something quickly. The only secret that he ever kept from me was just what he intended to do about his life and his personal ministry. He came to my home one day and said that he needed to talk with me. This is what he told: “Brother Wells, I hate to have to tell you this, but I have accepted a church in New Brockton, Alabama. I simply cannot take the strain here another thirty days. I’m leaving the work with you.” I was so shocked I did not know what to say or do. Momentarily it was devastating to me. But, God quickly undergirded me and I took courage for the work. At this trying time for me and the Callaway Assembly, God sent to me two precious people of God who pledged their help and support in continuing the work. They were Brother James and Sister Katherine Danley. They were a source of great encouragement and became most valuable to the work. They were well known in the present day church. We were advised one day that the tent must be removed because some purchasers of a new home in that neighborhood made complaints about our presence there. Brother and Sister Danley very graciously offered the use of some of their land just on the south side of their home. Their home, and the new tent location was in the area where the Reba Motel now stands, on Tyndall Parkway. Despite their move, our attendance continued to increase. And, the tent would never have to be moved again. Pastoring Callaway Assembly, was a very memorable time. An experience I shall never forget, nor will I forget those who were faithful to me and the church. God will surely give them special rewards when they get to heaven. Eventually, illness overtook me as it did Brother Knoles. I struggled for some time with poor health. I had to face it that I was no longer physically able to pastor the new church. My health had become a liability to the work. I sought to secure a replacement pastor for the work. After much prayer, I felt that God would have me to try to get Brother O.B. Harris to come pastor the church. I contacted the presbyter, Brother Crawford Railey, told him of my plight, and my feeling about Brother Harris. He told me that Brother Harris was to be in Marianna that night and if I wanted to I could ride up with him and both of us could talk to him. I did, but he said that the only way he would consider coming to Panama City, to pastor Callaway Assembly, was for me to remain as the Associate Pastor. I did not want to do that, but under the circumstances I had no choice. I was not able to continue pastoring the church, because of my health. So, Brother Harris became the third pastor of Callaway Assembly, and I returned to the associate’s position. It worked out well. Shortly after the pastoral change, a hurricane sideswiped Panama City, and the high winds totally destroyed the tent. It was left hanging in shreds. That left the church with no place to congregate for the services. But, God had not forsaken us. Brother Harris was able to local a vacant old store building that we were able to rent and move into. It was on Highway 22 just west of the Callaway Elementary school. It faced Highway 22. The store had been used as a ceramic shop. We quickly moved pews into the store building and were able to have services in it the very next Sunday. The church remained in that location for a number of months as Brother Harris and I sought land that we could afford and would be suitable for a church. Every parcel of land that we checked was priced out of our reach. Then, like a fresh wind from heaven, God began blowing His blessing upon Callaway Assembly! Unexpectedly Mr. Jap Burkett, the man who owned almost all the land in the area where the tent first stood on Cherry Street, asked us to come see him. He said, “I have two-and-one-half acres of land just down the street that I’ll make you a good price on if you can use it for a church.” It was the two-and-one-half acres where Callaway Assembly is now located. Mr. Jap said, “If you want it you can have it for $800.00.” As the old saying goes, that was dirt cheap for the land. Needless to say we quickly accepted the offer, although we did not have the $800.00. But by way of some co-signers, we were able to borrow the money from a local bank. We handed Mr. Jap the $800.00. He counted out $400.00 of the purchase money, gave it back to us, and said to take this money and pour the foundation for the new church. We did. Brother James Danley was an experienced building contractor so he was in charge of all the concrete work for the church. As soon as the foundation was poured, we were able to secure another loan to build the church. Brother Harris asked me to design and draw up the building plans for the new church. I did. With the full cooperation of the congregation of Callaway Assembly we were able to have a weathered in building in a short time, and immediately moved the church into the building. The men of the church would gather at the church each night and we would work long hours completing the interior. I took 8mm movies of the founding of Callaway Assembly; later transferred it to video tape. That video accompanies this article for the Callaway Assembly. The first revival in the new church building was conducted by Rev. and Mrs Clarence Lambert. 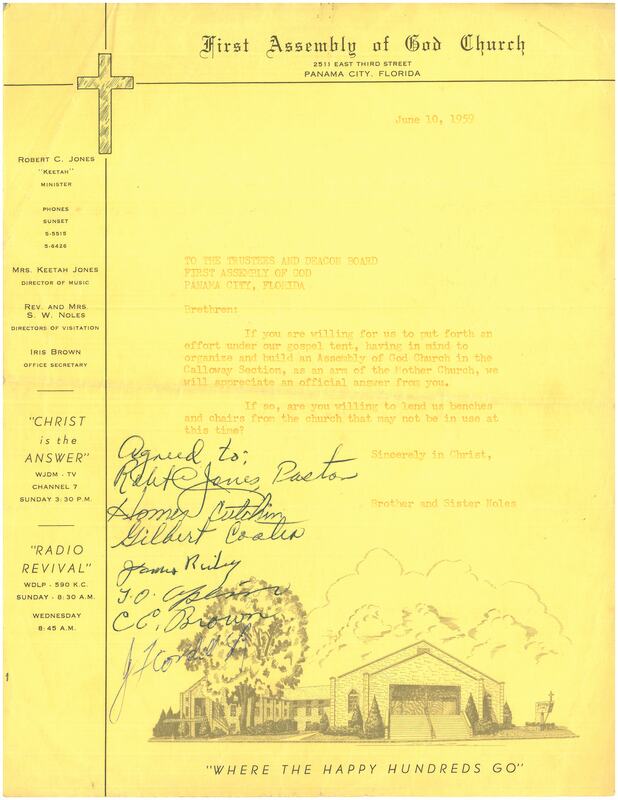 It was a gracious revival and resulted in another increase in church attendance. Sister Lambert ministered to the young people and certainly did a great job. Brother Lambert would later become District Superintendent of the Rocky Mountain District in Colorado. Brother Harris departed Callaway Assembly. He was able to accomplish much for the Kingdom of God, and should always be remembered for his sacrifices and hard labors at Callaway. The church was set in order by the District during his pastorate. After the departure of Brother Harris, Brother Lamar LeCompte became the church’s fourth pastor. Both Brother Harris and Brother LeCompte have long ago went home to be with the Lord. During the time of Brother LeCompte’s pastorate, I left the church to return to my evangelistic ministry. After the departure of Lamar LeCompte, Brother James Kelly, a native of Panama City, and the old Dirego Park Assembly, came and assumed the pastor of Callaway Assembly. He would later become a foreign missionary, and to my knowledge, he remains a foreign missionary. Callaway Assembly should ever be grateful to God for the men mentioned in this article. Without exception, all of them suffered and sacrificed that Callaway Assembly would be what it is today. Without them, there would be no Callaway Assembly. I thank God for the part that I was able to play in the founding of the church, and see it grow into a self-supporting church. The summation of it all is this: “For while one saith, I am of Paul; and another, I am of Apollos; are ye not carnal? Who then is Paul, and who is Apollos, but ministers by whom ye believed, even as the Lord gave to every man? I have planted, Apollos watered; BUT GOD GAVE THE INCREASE. So then neither is he that planteth anything, neither he that watereth; BUT GOD THAT GIVETH THE INCREASE.” (1 Corinthians 3:4-7).